Winter in New England is a special time of year, a season when the city sparkles with twinkling lights, warm wishes, and joyful festivities. Getting cozy when it's cold out is a great way to embrace the quiet nature of the winter season before the peak of the holidays. November brings the start of the holiday season to the city with tree lighting ceremonies that illuminate the night with thousands of festive lights. The biggest tree lighting event in the city takes place a short walk from our hotel at Boston Common, which is a large public park in downtown Boston. When Is the Boston Common Holiday Tree Lighting? This popular annual event takes place in 2018 on Thursday, November 29 from 6:00 p.m. to 8:00 p.m. You'll find the epicenter near the Visitors Information Center on Tremont Street. The evening's festivities begin one hour before, at 5:00 p.m., with a free ice skating show on the Boston Common Frog Pond that features competitive figure skaters from the U.S. and around the world. After the tree lighting ceremony, the Frog Pond will open for public ice skating until 10:00 p.m. Boston Common is two blocks from our hotel, about a nine-minute walk away. What Happens at the Tree Lighting Ceremony at Boston Common? Mayor Marty Walsh will welcome the arrival of the special holiday tree sent to the city of Boston from Nova Scotia, which symbolizes the friendship between the two places. The Mayor will be joined by members of the Royal Canadian Mounted Police and Santa Claus. Enjoy refreshments and live entertainment by local performers - and then 7,000 lights will go on around 7:55 p.m. on the tree. This is followed by tree lightings on almost one hundred other trees throughout Boston Common and the Public Garden. It's truly a sight to behold! The night closes with a colorful display of fireworks over Frog Pond. Faneuil Hall Marketplace Tree Lighting & Music-Light Show BLINK! Another popular holiday lights display is at Faneuil Hall Marketplace, just one mile from our hotel. It features the biggest holiday tree in the Northeast at Boston's historic marketplace, which has been open since 1743. The fun begins at 2:00 p.m. on Wednesday, November 28 with caroling and holiday entertainment. The tree lighting ceremony begins at 7:00 p.m., with the lights switching on around 8:00 p.m. Faneuil Hall is also a great place to get a little gift shopping done and there are plenty of restaurants and taverns when you need a break from the holiday hubbub. Also on that day and every day through January 1, the music-light show BLINK! begins at 4:30 p.m. and will run every hour on the half-hour from 4:30 p.m. to 10:00 p.m. It's a synchronized music and light show that brings to life the decorations and trees of the marketplace. Where are the Boston Holiday Tree Lighting Ceremonies? Columbus Park Trellis - Monday, November 19 at 5:00 p.m.
Copley Square Tree Lighting - Monday, November 26 at 5:00 p.m.
Massachusetts State House Tree Lighting - Tuesday, November 27 at 5:00 p.m.
Faneuil Marketplace - Wednesday, November 28 at 7:00 p.m.
Commonwealth Avenue Mall - Thursday, November 29 at 8:30 p.m.
North End Tree Lighting - Friday, November 30 at 6:00 p.m.
Make this season one that you'll always remember at our uniquely designed hotel, the perfect retreat for a warm winter escape. Stay in the heart of the city's lively Theater District, steps away from Boston Common on Stuart Street. Stroll Boston's historic neighborhoods and feel the rebellious spirit of the city on the Freedom Trail. Explore top attractions like the Boston Public Garden (0.4 miles away), Boston Tea Party Ships & Museum (1 mile away), and the New England Aquarium (1.4 miles away). 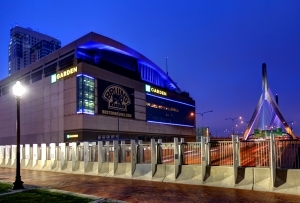 It's just a ten-minute walk to Back Bay Station for easy access to public transportation. What stirs your spirit? Perhaps it's craft beers or Broadway hits. Maybe you love big breakfasts, little dogs, or watching The Bachelor in your pajamas. Whatever floats your boat - we have amazing Boston vacation packages that make travel planning easy. 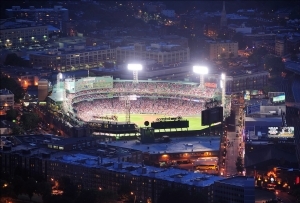 And our excellent location near Boston Common puts you in the center of the city so that you can step out and explore. Walk to cool restaurants, cozy cafes, and exciting theaters. Go shopping or grab a coffee and stroll through the park. Are you up for the adventure? 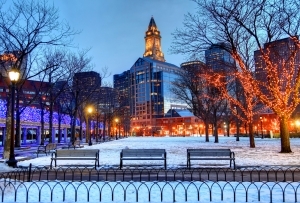 Immerse yourself in the dynamic spirit of Boston and plan your winter getaway today!